500 prints. 12 printers. 2 days. We built a Popup Factory for SOLID Conference 2015 — where we printed, soldered and assembled wearable bands for attendees. Here’s what we learned. We were approached by Solid Conference’s organizers O’Reilly Media with a challenge: design and construct a PopUp Factory in a matter of hours, print 500 parts, and disassemble it — all within two days. Armed with 12 Form 1+ desktop 3D printers, we joined a team of all-star designers and engineers to create 500 customized, interactive wearable Alike bands on the show floor. 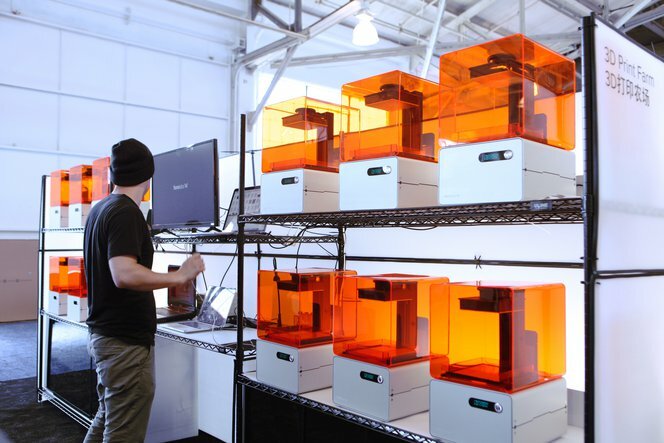 With a farm of Form 1+ 3D printers, small to mid-size manufacturing becomes immediate and flexible. At capacity, our 12 printers produced 84 parts every 4 hours. Added up, this become a rate of over a 1000 parts a week. Rather than just printing the same thing over and over, with 3D printing we could churn out unique, one-of-a-kind designs, each with its own edition number. Prototype early and often. The electronics package and Alike design were the result of extensive research and development by Marcelo Coelho studio, including a clever snap fit enclosure that would serve as the blank canvas for our one-off designs. Design for small-batch. 100–10000 is the new sweet spot for digital manufacturing, and is no longer the “valley of death” for startups. Compared with the high costs of injection molding tooling domestically, and delays in manufacturing abroad, a small pop-up factory like ours was capable of producing over 250 customized enclosures in an 8-hour day, for approximately the same per-part cost. Your design can evolve. With reliable, high-resolution 3D printing, you don’t need to lock in your design. A key benefit of 3D printing is the ability to edit on-the-fly and make changes without expensive retooling costs. With our 3D print farm, we pushed to create something not only at scale, but unique for every visitor. Procedural design tools like Grasshopper makes it possible to create hundreds of iterations. While our collaborators David Cranor, Marcelo Coelho and Seeed Studios fabricated the electronics and toured markets in Shenzhen, China, we shared early morning and late night video calls to review designs and collaborate across continents. Test fitting 3D printed components with the Alike wearable bracelet. Everything snaps together! We held our breaths as the circuit boards and injection molded backs arrived for a test fit. With the deadline hours away, it would add major delays if the components didn’t fit. But tolerances on the Form 1+ prints held true and the circuit board, neoprene band, and enclosure came together with a satisfying snap. The Alike bracelet functioned as an icebreaker between attendees — the green light indicates a match in interests. It was incredible knowing that we came together to develop and produce a product in a matter of weeks. A 3D print farm is now an effective tool for agile manufacturing. With new, 3D printable functional materials providing greater durability, the choices available to designers are expanding. It’s exciting to think of the new visions this will make tangible now and in the near future. The team that made this happen!